How to drive fame and consideration for East Midlands Trains (EMT) whilst promoting key business offerings (Mobile Tickets, Lost Property Service)? Using a two-pronged approach, we focused on launching two key business offerings – Mobile Tickets and the Lost Property Service – to help build brand love for EMT. Just the Ticket (Mobile Tickets)- We challenged celebrated paper artist, Ed Chapman, to portray the nation’s favourite East Midlanders as voted by the public (eg Gary Lineker, Alan Carr and Sir David Attenborough). using 3,000 paper tickets. The number of paper tickets highlighted the amount sold on the network each hour that could now become digital. 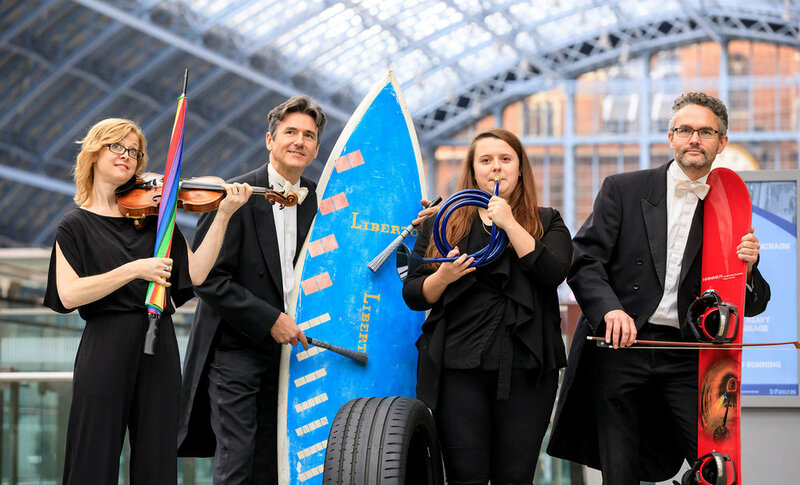 Lost in Music (Lost Property) - We partnered with the Royal Philharmonic Concert Orchestra to create the Lost Property Orchestra, inviting musicians to swap their traditional instruments for the inflatable cactus, 6ft surfboard and skis found in EMT’s Lost Property. The orchestra compiled a bespoke piece of music, consisting of 11,304 notes, the exact number of items left on EMT services in 2017. Titled ‘An Ode to my Former Owner’ the orchestra delivered a one-off performance at St Pancras station. Our brand-building campaign really made the media take notice of the regional train provider on a national scale. - Andrew Commons, PR & Comms Manager, East Midlands Trains.